Chief Guest's Remarks:National level programme like the Pradhan Mantri Krishi Sinchai Yojana which aims at More Crop Per Drop, swastha dhara – Kheth Hara, launched to maintain soil fertility for which soil cards are issued, Pradhan Manthri Fasal Beema Yojana for overcoming the inherent deficiencies of National Agricultural Insurance Scheme, Rashtriya Gokul Mission to develop and conserve indigenous breeds of cows, 585 mandies linked with e-NAM portal to enhance the capabilities of farmers to decide the price of their agricultural produces are such pragmatic initiatives of the Modi government. Government also made a move to double the income of the farmers by 2022 focusing on the seven point strategies which would enable to covert this initiatives in to Sankalp Se Siddhi which in other words is determination to attainment that constitute the pledge for doubling of farmers income by 2022. Post Event Details:ICAR – Krishi Vigyan Kendra, CARD, Pathanamthitta District organised Sankalp Se Siddhi – A New India Movement programme on the 25th of August 2017. The programme was inaugurated by Sri. Anto Antony MP and Shri. Raju Abraham, MLA served as the guest of honour. The function was presided by Rt. Rev. Thomas Mar Thimotheos, Chairman, ICAR-KVK, CARD. 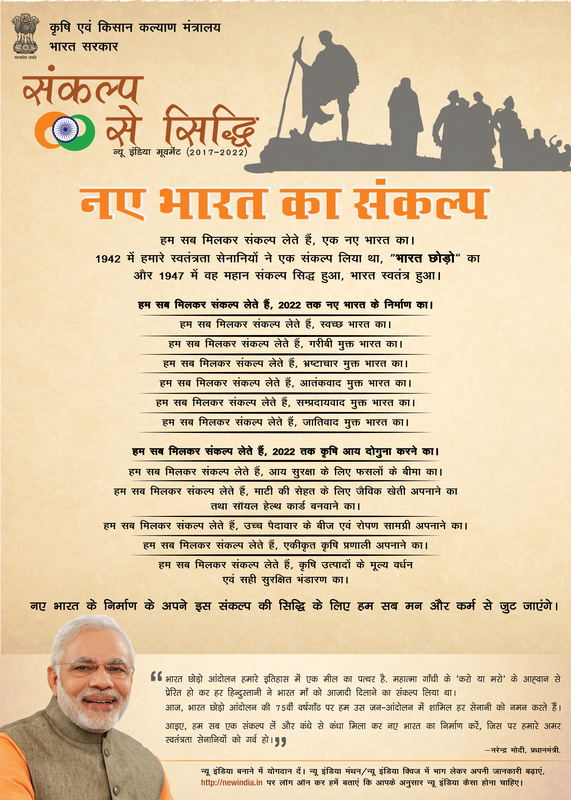 The message of the Hon.Prime Minister Sri. Narendra Modi was read out at the function By Dr. C. P. Robert ,Senior Scientist and Head ,ICAR- KVK ,CARD, Pathanamthitta which was followed by the pledge and screening of the five minute film. The Prime Minister’s clarion call “Sankalp Se Siddhi’ through effective and efficacious implementation of agricultural initiatives is a wakeup call for the farmers and technocrats for accelerating the agricultural growth, rejuvenating agriculture thereby doubling the farmers income by 2022. On the occasion KVK’s Newsletter, Sankalap Se Sidhi –Malayam Booklet and Organic Inputs was released by Sri. Anto Antony MP. Processed products from Jackfruit was released by Smt. Annapurna Devi, President, Pathanamthitta District Panchayat.